The Chekhov Authoring Platform was designed from the onset to allow for the breadth of the world to be able to learn to read regardless of language. The primary goal is to increase the number of readers by 100 million by 2020, through the growth of literate communities and local partner ecosystems in multiple languages. With the primary notion of educating and developing individuals literacy skills, regardless of language, another goal came to mind. The secondary, but very important goal, is to assist in the preserving and evangelizing of minority languages. From an estimated 7013 languages spoken on the planet, 95% of these are spoken by less than 100,000 people. Preserving these languages and having access to literacy resources in their own language, which are representative of their own cultures, is an urgent need for these communities. The Chekhov team is proud to be able to assist in both of these goals! 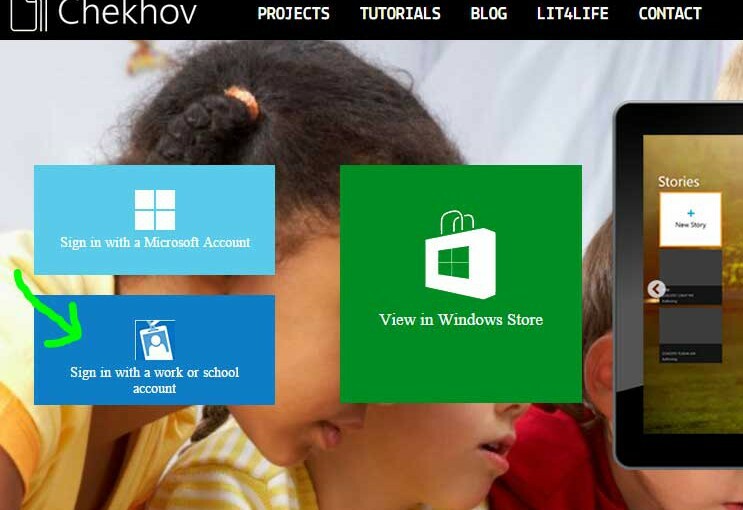 Chekhov was mentioned in the Microsoft EU Policy Blog for being part of an initiative focuses on developing sustainable, relevant, culturally-appropriate and scalable solutions to addressing illiteracy. Chekhov, a free tool which allows anyone, anywhere to write, publish and distribute a dynamic eBook which can be used by learners across the globe to develop their literacy skills. Here is a walk-through of adding Chekhov Story Author to your Office 365 online app menu! Follow the instructions here to add Chekhov Story Author as a custom tile for your organization’s Office 365 account. Chekhov Story Author now offers the ability to sign in with either your Live ID or an Office 365 ID! This offers the convenience to those who may have school accounts on Office 365 and can allow for Office 365 menu integration too! Click the dark blue “Sign in with a work or school account” tile to login with you Office 365 account. We have completed an update to the website to include the latest educational offerings! The Website now has a section devoted to the new Digital Education Services! DES is an easy way to get to fun educational applications that allow teachers and students to excel. DES can be used to access all of the best from the Microsoft Learning Community. Making learning fun and easy means better learning results! With access to 9 services including Chekhov Story Author, Microsoft Math, World Reader and more, DES delivers great educational apps available in a convenient location. This allows for simple access and consistency for students, while providing an easy to manage way to make quality applications available to teachers. Microsoft won the Gold Award for best Corporate Documentary in the category “Innovations and Sustainable Technologies”, for “The First Mile” at the Deauville Green Film Festival which took place in Deauville, France, on 9th – 11th of June. The judging panel included filmmakers from the BBC, Discovery Channel and The National Geographic. The film was written and presented by Steven Duggan, Director, Worldwide Education Strategy for Microsoft Corporation, and directed by Ian Campbell from RGI Films. The short film, “The First Mile”, which evangelizes the genesis and evolution of the Literacy for Life program was produced to help increase global awareness of the Illiteracy challenge. Check out the video at https://vimeo.com/130187203. Congratulations to Steven and Ian on the achievement. The services accessible at www.lit4life.net, created by Terawe, have now been used by teachers, students and educational organizations across the world to create and publish e-books in multiple languages. The Chekhov Story Author App, which has been available at no cost through the Literacy For Life partnership, was developed to help anyone create and share an original e-book with the world. Anyone can create their own Chekhov story by using the app, available here. latest blog post talks about a number of technologies being used in the classroom including our very own Chekhov Story Author!